Here is my latest mock draft. It is using the draft order that is current as of last week, but I finished the analysis for all of the selections today and I didn’t want to scrap it when the new draft order comes out on Tuesday, so I finished it and I am going to post it. Hopefully it is still interesting, it took a lot of work to put this all together. Let me know if you like or dislike your teams pick! Comments are very much appreciated. Enjoy! 1. Carolina (1-10)- Andrew Luck, QB, Stanford- If Andrew Luck doesn’t come out this year there will be a lot of disappointed teams at the top of the draft board, and Carolina would be one of them. Yes, they drafted Jimmy Clausen in the 2nd round last year, but he is not a good enough prospect nor he has he played well enough as a rookie to warrant passing on Luck here. Luck has such great intangibles, pretty good arm strength, good accuracy, he has two years of starting experience in a pro-style offense and has good size as well. If he comes out I would be shocked if he didn’t go in the top three overall selections. 2. Detroit (2-9)- Da’Quan Bowers, DE, Clemson- Bowers surprised me this year as I was ready to write him off as a very physically talented player who never translated his physical ability into production, but he made me eat my words this year as he has amassed over 15 sacks already this year. I don’t know how good his burst is off the line of scrimmage, but he is very strong and should test very well. This might seem a bit high for him now, but he is a terrific athlete for the LE position and having a LE who could potentially be a 10+ sack guy is something that any team would love to have. I don’t know if I think he will actually be that kind of a defensive end, but his physical ability certainly makes it a possibility. Detroit could really use a stud LE like Bowers and their defensive line could be terrifying with Suh, Bowers and a seemingly revitalized Kyle Vanden Bosch on the line. 3. Cincinnati (2-9)- A.J. Green, WR, Georgia- A.J. Green is an extremely talented WR. He has great hands, he is a very good deep threat, and he demonstrated his value to Georgia by helping them turn around their seemingly doomed season once he returned from his suspension. Cincinnati needs some young talent at WR. I like Jordan Shipley and he projects to be a very nice slot receiver for the Bengals, but Chad Ochocinco is getting up in age and Terrell Owens, despite his fantastic statistical season, can’t have a lot left in the tank at this point. Drafting A.J. Green would give them a future replacement for Ochocinco and would help soften the inevitable blow their offense will suffer from when T.O. starts to come back to earth. 4. Buffalo (2-9)- Ryan Mallett, QB, Arkansas- I have been saying for a long time that Mallett seems like a very likely candidate to go in the top 5 because some team will fall in love with his amazing combination of size and arm strength, but I am not a fan of Mallett despite this assertion. His footwork needs improvement, I am not sold at all on his intangibles from an intelligence standpoint, nor do I think he makes his team better for being on the field. He doesn’t seem clutch or reliable in critical situations to me, and combining that with his questionable intangibles (in my opinion) makes me doubt him as a NFL prospect. But that doesn’t mean he won’t go early in the draft and get a boatload of cash, and the Bills could really use a QB. Fitzpatrick has played better than expected this season, but if they believe Mallett is a Franchise QB (which I don’t) then they will pick him. 5. Arizona (3-8)- Prince Amukamara, CB, Nebraska- The Cardinals could really use a QB, but Andrew Luck and Mallett are off the board and I’m not sure Jake Locker is worth a top five selection considering his relatively disappointing senior season. I don’t think the Cardinals will want to invest in someone who is as big of a risk as Locker is right now considering the amount of development he will need once he gets to the NFL. I’m a Locker fan, but he needs some coaching up once he gets to the NFL. The Cardinals do have other needs though, and cornerback is one of them. Dominique Rodgers-Cromartie is a good corner, but they have little talent opposite him or behind him. Amukamara is without a doubt the top senior corner and may be the top corner in the draft considering Patrick Peterson’s potential move to safety in the NFL. 6T. Denver (3-8)- Marcell Dareus, DE, Alabama- Denver has serious issues versus the run and one thing that McDaniels should realize is that the Patriots built their defenses by adding talent along the front 7, and that should be the Broncos plan of action as well. Dareus is a very big, strong, powerful defensive lineman and I think he projects perfectly to the 3-4 DE position in the NFL and he has plenty of experience playing it in Alabama’s 3-4 defense. Dareus should help solidify their defensive line within his first two seasons on the team. 6T. Dallas (3-8)- Patrick Peterson, CB, LSU- Dallas needs serious help at safety and Peterson is an absolute freak athlete who has great size, speed and ball skills. He projects very well to corner and just as well to safety, and could very well be an impact player at FS in the NFL. Having someone with his speed and playmaking ability over the top of the secondary would really make the Dallas secondary very talented and dangerous. 8. San Francisco (4-7)- Jake Locker, QB, Washington- Is Locker a top 10 pick right now? I’m not sure, but I wouldn’t be surprised if he went this high when it is all said and done. He has a strong arm, he is very athletic and he has great intangibles. He needs some coaching and development, but I think he has the potential to be an effective NFL QB. I don’t know if he will ever be the franchise QB that so many people thought he would be after his junior season, but I do think he can be effective. Troy Smith has shown flashes this season, but if the 49ers are sold on Locker they should select him. Alex Smith is a 100% certified bust and Troy Smith should remain the starter for at least a year before Locker competes to take over in his second season. 9. Minnesota (4-7)- Nick Fairley, DT, Auburn- Do the Vikings have bigger needs than defensive tackle? Yes. QB, Safety and potential Left Tackle depending on what they do with Bryant McKinnie. It’s hard to believe he was voted into the Pro-Bowl just a year ago. Regardless, the heart of the Vikings defense has been their ability to stop the run for years, but that has changed dramatically this year. Pat Williams is wearing down and should probably be released after this season, and despite his lesser numbers this year Kevin Williams is still a very good defensive tackle. But he can’t do it all himself. 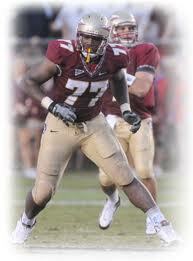 Nick Fairley is an very talented defensive tackle and honestly he reminds me a bit of Kevin Williams. He has great size, great quickness off the ball and with one move he can beat the offensive lineman and penetrate into the backfield. Getting Fairley would give them a quality defensive tackle to play next to Kevin Williams at some point and they would also have a potential replacement for K-Will as he gets older. 10. Cleveland (4-7)- Justin Blackmon, WR, Oklahoma State- This might seem high for Blackmon, but I don’t think so. I’ve seen him play a number of games this year and he impresses me every time I see him. He has solid size at 6’0” but he is powerfully built and he is arguably as physical as any receiver in the country. He seems to run relatively effective routes and though I haven’t scouted him specifically yet he seems to have reliable hands. The Browns could very well pick Julio Jones here, but I think Julio Jones might remind them a bit too much of Braylon Edwards. He has incredible potential and ability, but his lapses in concentration will result in drops at times. Blackmon is a very good WR and I have him graded as a top 15 pick right now, so I won’t be surprised if he goes this high at all should he declare. 11T. Seattle (5-6)- Robert Quinn, DE, North Carolina- Robert Quinn definitely has top 10 talent but I am not entirely convinced he will go that high. He has two years of film on him, but he was very raw and really just demonstrated his freak ability and potential, but didn’t show much in the way of technique or sound fundamentals during his first two seasons. He has a lot of raw ability but he needs probably a year or two of coaching before I think he will be an effective starter. He could definitely be used in a rotation to try to get a speed rush on 3rd down situations before he becomes a starter, but if his technique and hand usage aren’t developed he will not be effective in those situations. But Pete Carroll is not afraid of a gamble on a guy with character questions and the Seahawks really need a pass rushing boost, so it could be a match made in heaven if Carroll and his coaching staff can develop his ability. 11T. New England (from Oakland 5-6)- Akeem Ayers, OLB, UCLA- Akeem Ayers strikes me as a prototypical Patriots player. He is very well rounded and he is good as a pass rusher and in coverage, and the Patriots could really use some talent at OLB because they have had trouble finding quality players to play that position. The strength of the Patriots defenses have always been their front seven, and with Ayers at OLB their defense would definitely be strengthened. 13. Washington (5-6)- Julio Jones, WR, Alabama- The Redskins desperately need talent at receiver so McNabb will have somewhere to go with the ball. Julio Jones is without a doubt the best WR available at this spot and the Redskins would love to have him. He has the highest ceiling of any WR in this draft in my opinion because of his combination of size, speed and ability to make incredible catches. He needs to work on concentrating on routine passes to make sure he doesn’t drop as many catchable balls, but he could really help open up the Redskins offense. 14. Tennessee (5-6)- Bruce Carter, OLB, North Carolina- The Titans need OLB help very badly and Bruce Carter is probably the most athletically gifted OLB in this draft class. Carter might not be the most fundamentally sound linebacker, but he has the potential to be a special teams ace as well as an impact linebacker. I think that after he tests well and showcases his athletic ability he will be a virtual lock for the top 20, so I could definitely see him going as high as #14 overall. 15. Houston (5-6)- Brandon Harris, CB, Miami- The Texans have had issues in the secondary for about as long as they have existed, and that problem was only magnified by losing Dunta Robinson in free agency last offseason. The Texans could really use some help at corner and at safety, but there is not a safety worth this selection. Brandon Harris is a very athletic corner and he has good ball skills and could really help replace Dunta Robinson in their secondary. 16. San Diego (6-5)- Justin Houston, OLB, Georgia- Justin Houston has had a great junior season and I would be very surprised if he didn’t declare and end up in the top 20 selections. The Chargers really need help at OLB because Shawne Merriman is now a Buffalo Bill and Larry English has not panned out as an OLB like they hoped he would have. Houston is not a tough projection for the 3-4 OLB spot in the NFL because he has played that position effectively in Georgia’s new 3-4 defense, which makes this a very easy selection. 17. Indianapolis (6-5)- Drake Nevis, DT, LSU- The Colts really need help versus the run but they don’t like big run stuffers who take up blockers. They like athletic defensive tackles who can get off the ball, penetrate and make plays in the backfield. There aren’t many defensive tackles who have done a better job of doing just that than Nevis this season. He has been extremely disruptive all season and he is quick off the ball, has impressive hand usage and does a good job of regularly beating one on one blocks. He would give the Colts some much needed talent at the defensive tackle position. 18. Miami (6-5)- Mark Ingram, RB, Alabama- The Dolphins have two talented RB’s in Ronnie Brown and Ricky Williams, but Ronnie Brown is about to turn 29 years old and has had trouble with injuries and Ricky Williams will be 34 in May. Both of them probably have a couple of productive years left, but the strength of the Dolphins continues to be their running game and without a healthy back or two their offense struggles to sustain drives and produce on offense. Mark Ingram could step in as a rookie and contribute immediately as a runner and could replace either back depending on who gives out first or who starts to tail off. One of them figures to get injured at some point next year, and having Ingram would be fantastic insurance for both of them. Not to mention he is prepared to be a workhorse back in the NFL which is what the Dolphins will need in a couple of seasons. 19. Tampa Bay (7-4)- Janoris Jenkins, CB, Florida- Tampa Bay has a talented corner in Aqib Talib, but opposite him the talent at corner is questionable at best. Jenkins is a local Florida talent and he has fantastic ball skills, supports the run very well and is a good tackler. I’m not sure how good he is in man coverage yet, but having two playmakers at corner like Talib and Jenkins would mean a lot of turnovers for the Bucs once Jenkins breaks into the starting lineup. 20. Green Bay (7-4)- Cameron Jordan, DE, California- The Green Bay Packers have had a lot of injuries this year but one spot they didn’t have an injury was at defensive end. Why do they need one then? Because Johnny Jolly, their quality defensive end, was suspended for the season for charges related to marijuana. The Packers elected to move Ryan Pickett from NT to DE and promoted B.J. Raji into the starting line-up which has worked well for them, but I don’t think that is a lineup that will be productive for the long haul. Cameron Jordan has had a very strong senior season and he is good versus the run as well as the pass, and the Packers could look at him and see him as a productive 3-4 DE. I’m not sure how well he handles double teams because I haven’t watched him play enough yet, but if he plays well versus doubles he would be an ideal 3-4 DE for the Packers. They could also use cornerback help because who knows how much Woodson has left, but I’m not sure that is a position they will want to address in round one. 21. St. Louis (5-6)- Michael Floyd, WR, Notre Dame- The Rams really need a playmaker at receiver and I’m not sure that there is another position they need help at more than receiver. If the draft breaks this way I could see them trading down to try to add more draft picks to stockpile as much talent as possible. But if they stay here I think they will have to address the receiver position, and I think Floyd is the best receiver available at this point. Floyd may not have elite speed, but he has good size, he locates the ball well in the air, has great hands to make tough catches and I think he has a lot of potential as a receiver in the NFL. He has kind of a “prima-donna” attitude and I am worried a little bit about how hard he is going to work to improve in the NFL considering how easy he has had it at Notre Dame, but those are just my concerns personally. 22. Jacksonville (6-5)- Ryan Kerrigan, DE, Purdue- I would love to have Kerrigan fall to the Falcons, but I don’t think the Jaguars would pass on him. They really need pass rushing help and Kerrigan has been incredibly productive this season. He has a great first step and he really gets off the ball quickly, plus he has as good a motor as anyone in the country, which really says a lot. He should be able to contribute early since I think he is pretty NFL ready, but I’m not sure his ceiling is much higher than a 5-8 sack LE in the NFL. That’s better than what the Jaguars currently have though. 23. Kansas City (7-4)- Von Miller, OLB, Texas A&M- The Chiefs really need an OLB to help take some pressure off of Tamba Hali and Von Miller seems to be a perfect fit for them. He has recovered well from a slow start to his senior season and he has had a productive season. I think he projects very well to the 3-4 OLB position and the Chiefs could really use his pass rushing ability. 24. New York Giants (7-4)- Stephen Paea, DT, Oregon State- The Giants love quality DT’s who can get upfield and penetrate into the backfield. Paea is freakishly strong but he is very quick and would fit in well on their defensive line. He would help make up for the disappointing players the Giants have at the position besides Barry Cofield. 25. Philadelphia (7-4)- Travis Lewis, OLB, Oklahoma- The Eagles really need some help at OLB as they have tried a number of ways to fill that void but none have been particularly effective. Lewis is a talented linebacker who is very good in coverage and has played a significant role in making Oklahoma’s defense as good as it has been this year. He would fit in well in the Eagles defensive scheme in my opinion. 26T. Chicago (8-3)- Derrick Sherrod, OT, Mississippi State- I was trying to decide if Sherrod or Castonzo would be the pick here but I gave the slight edge to Sherrod this time. Castonzo would be a safe selection but I think Sherrod offers them more options as far as playing left or right tackle depending on how Chris Williams pans out at some point. 26T. New Orleans (8-3)- Greg Jones, OLB, Michigan State- The Saints really need OLB help and while Jones is not a very big linebacker I think he is one of the best linebackers in the country. He plays smart and is the heart of Michigan State’s defense. He would fit in well in the Saints scheme in my opinion and would look really good playing next to Jonathan Vilma. 28. Baltimore (8-3)- Aaron Williams, CB, Texas- The Ravens really need a playmaker in the secondary and Aaron Williams comes from a Texas program that has produced a lot of talented defensive backs over the years. He hasn’t had the best season this year, but he is very athletic and has good ball skills and that is something that has to be attractive to the Ravens who need playmakers in the secondary very badly. 29. Pittsburgh (8-3)- Gabe Carimi, OT, Wisconsin- It might seem strange that Carimi is the pick here instead of Castonzo, but Carimi fits the Steelers’ scheme so much better than Castonzo because of Carimi’s ability to open holes in the running game. He has good size and strength and is good in pass protection, but I don’t think he will be a LT in the NFL, but he should be a quality RT for a long time. 30. New England (9-2)- Adrian Clayborn, DE, Iowa- A lot of people might not think Clayborn is going to slide this far, but I think he might when it is all said and done. He has not looked dominant at all this year, and contrary to last season when he seemed to demand a double team I have watched him get blocked one on one effectively most every time I have watched him. I don’t know where the dominant Clayborn has gone, but I don’t think I would spend a top 20 selection on him after having watched him this year. However, the Patriots are notorious for taking advantage of a player they like falling and being available at the end of the 1st round and I could see them taking advantage of this. 31. New York Jets (9-2)- Cameron Heyward, DE, Ohio State- The Jets could really use a 3-4 DE and Heyward is an absolute mammoth of a man. He has great size and strength and projects perfectly (in my opinion) to the 3-4 DE spot in the NFL. 32. Atlanta (9-2)- Lance Kendricks, TE, Wisconsin- I would be really surprised if the Falcons stayed at this spot if the draft broke this way, I think they would be much more likely to trade down. Remember, Thomas Dimitroff made his name in the Patriots organization before he was hired as the General Manager of the Falcons. However, if they stay here they should be looking for a DE, WR, potentially an offensive lineman, potentially a cornerback or a tight end. There is not a defensive end worth this selection in my opinion, nor is there a corner I like for the Falcons defensive scheme available right now. I think that TE is an underrated need for us because Tony Gonzalez is such a key cog in our offensive system and his reliable hands have resulted in a lot of key conversions for us since we have gotten him. Lance Kendricks might not have had the best season of any TE available this year, but I have been high on him since he was a sophomore TE on Wisconsin. D.J. Williams is another option given the season he has had this year for Arkansas, but Kendricks is a much better blocker and is comparably dangerous as a receiver, so I think he would be a perfect fit in Atlanta. Thanks for reading guys, hopefully you enjoyed it! Let me know what you think!